The kit comes with eight products - Lights, Camera, Lashes Mascara; Beauty & the Box Amazonian Clay Shadow Quad in Brewed Awakening; Cashmere Waterproof Gliding Liner in Dewy Green; Pure Maracuja Oil (1.7 fl. oz bottle); Maracuja Creaseless Concealer in Fair; Maracuja Divine Shine Lip Gloss in Ethereal; Airblush Maracuja Blush in Shimmering Peach; and a blush brush. Now, I'm not going to talk about the mascara, maracuja oil, or concealer because they're exactly the same the products contained in the first installment of the TSV (I'm not even ready to open these yet, actually) but you can read my thoughts about them here. Fortunately, the packaging isn't the only thing that the Brewed Awakening quad has going for it. 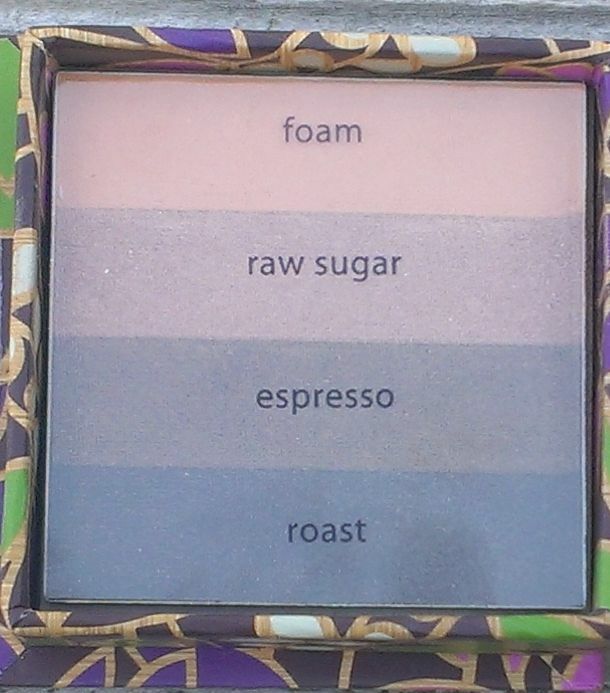 The shades include Foam, a matte peach; Raw Sugar, a shimmery golden taupe; Espresso, a shimmery mid-tone golden brown; and Roast, a rich, dark brown with slight shimmer. Now, you know me - just mention peach colored makeup and you've got me hook line and sinker. 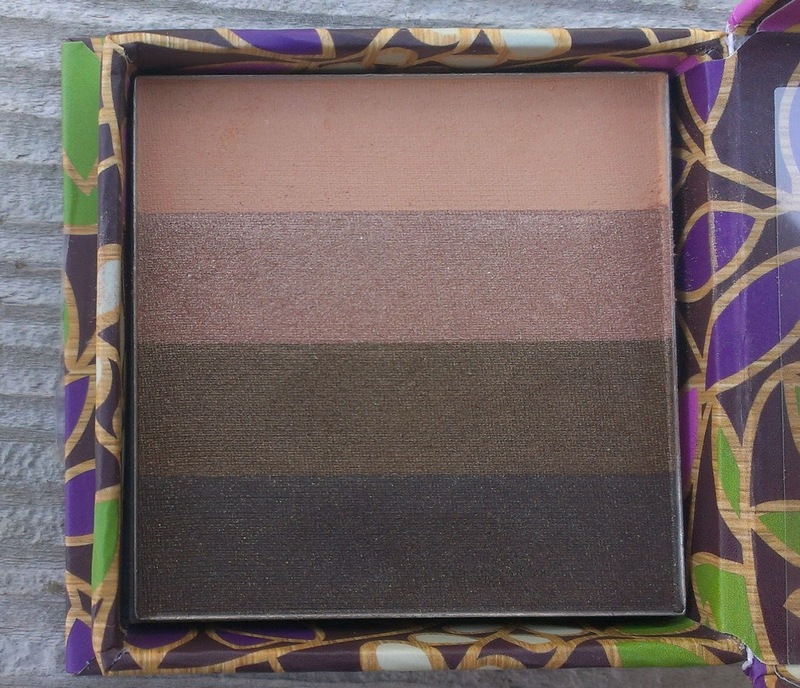 But the rest of the shades in this quad are equally stunning. Raw Sugar is a particularly gorgeous shade, which has such a lovely brightening effect on the eye. Having used all of the shades today (I followed the look provided in the little pamphlet that came with the kit, though I did add in a matte highlight shade), I can say that they're nicely pigmented and really easy to blend. I like this formula a lot. 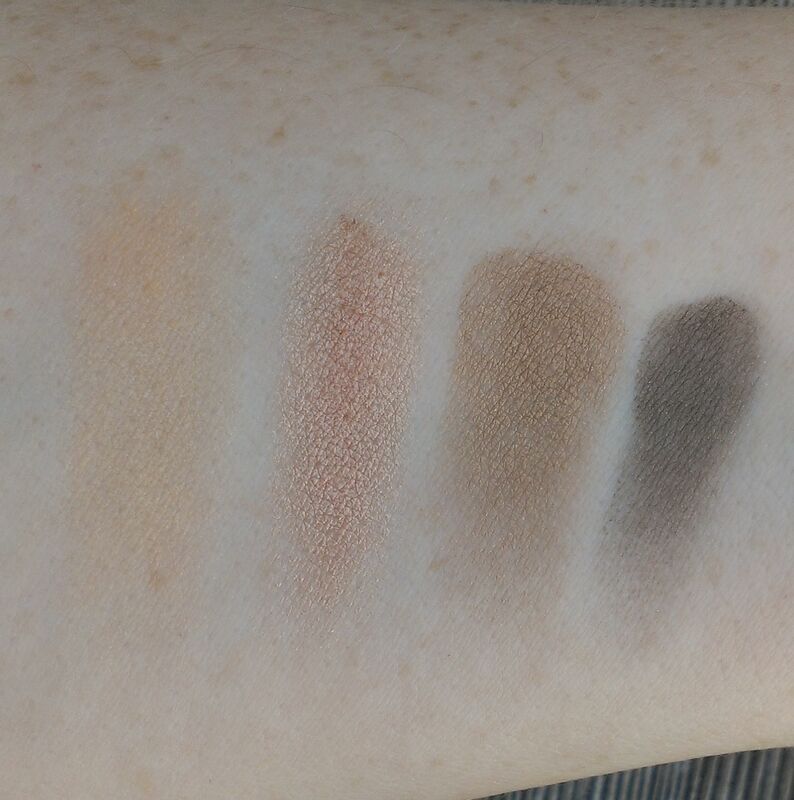 Oh, and FYI - I didn't use a base when I swatched these. I usually don't when doing swatches, but I've never mentioned that before and I know some folks like to know about that kind of thing. 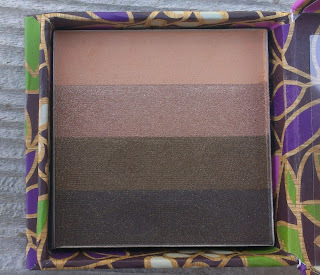 In the future, unless I specify, you can assume all of my shadow swatches are sans base or primer. I think that these shades could work on pretty much anyone, but if you've got blue eyes, it's especially killer. Every time I caught a glimpse of myself in the mirror today, I was like, Wow! My eyes look super, super blue today. 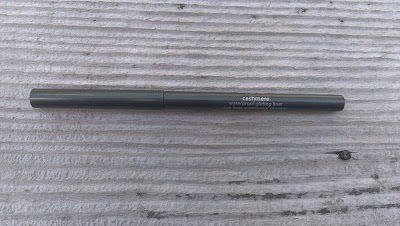 When I first saw the green Cashmere Waterproof Gliding Liner that came with the kit, I thought it was an odd choice for pairing with the warm shadow tones. However, after wearing them together all day, I've got to say, I really, really like the combo. Dewy Green is actually a deep forest-y green shade. It's not really an in-your-face green. 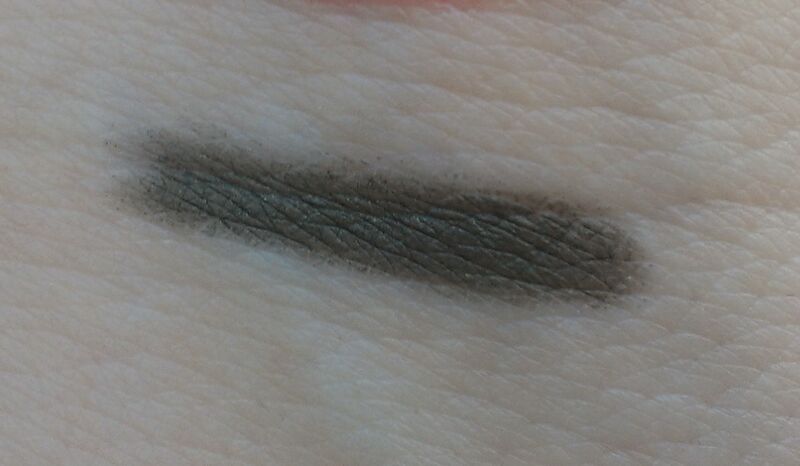 Instead, it's a really soft, pretty alternative to a black or brown liner. 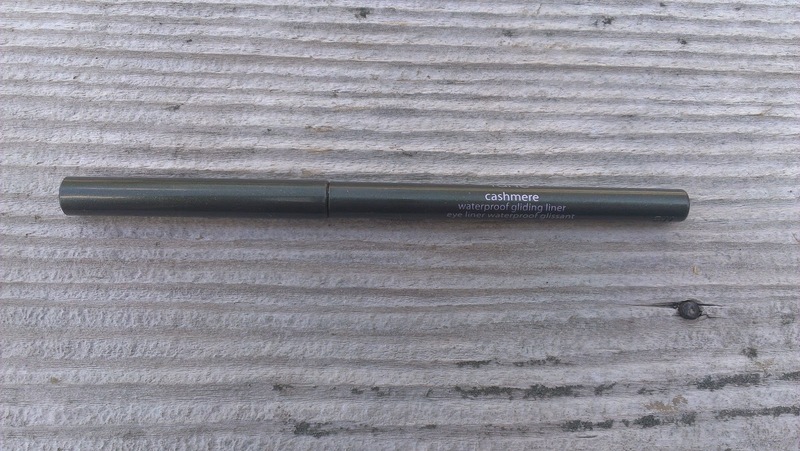 The formula of these liners is really nice too. It's smooth and easy to apply, but lasts a really long time. As I'm writing this, I've had the liner on for nearly 12 hours and it's still as dark and deep as when I first applied it. 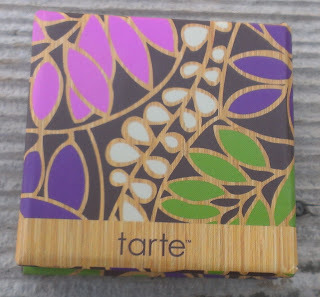 I don't think these liners are available on their own from Tarte yet - at least, I couldn't find them on Tarte's website or QVC.com - but when they are, I definitely recommend them. 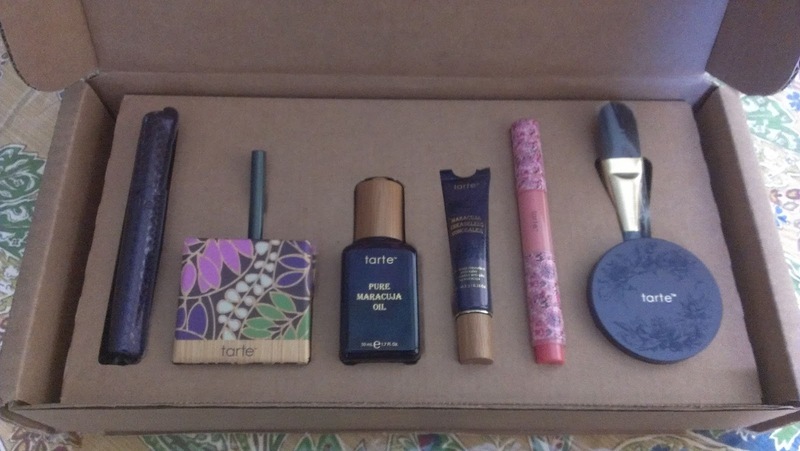 I was kind of bummed when I saw the Maracuja Divine Shine Lip Gloss that came with this kit. 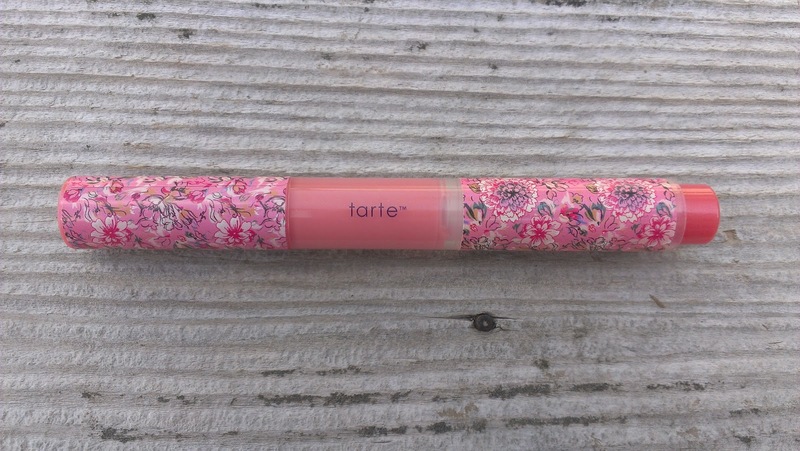 The shade is called Ethereal, and honestly, in the packaging, it looked like a dozen nondescript pink glosses I've already got in my collection. But that's why you shouldn't judge a book by its cover. 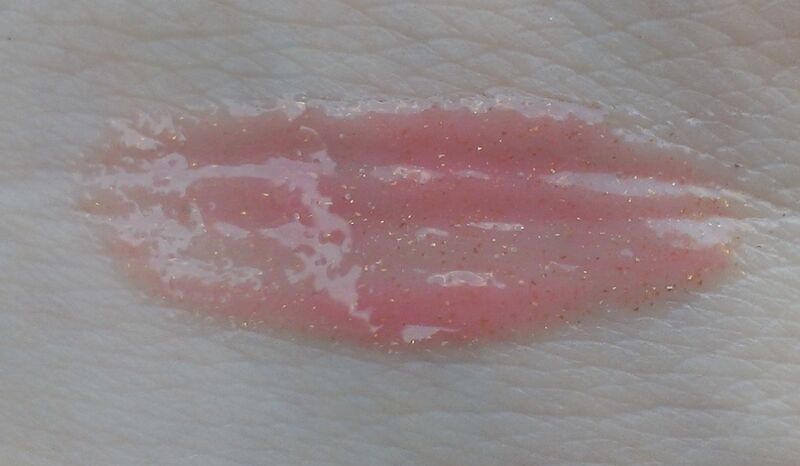 Because Ethereal is actually a really cool peachy pink shade with gold and red(!) shimmer throughout it. I am in love with this shade. 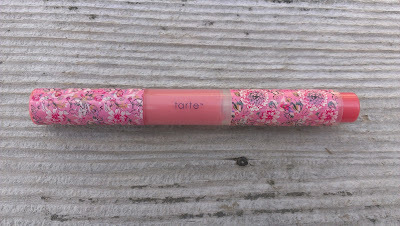 The formula of these glosses is pretty nice - not too sticky but thick enough that it stays on the lips for a while. Its only flaw is the annoying click pen style applicator. I hate those damn things. 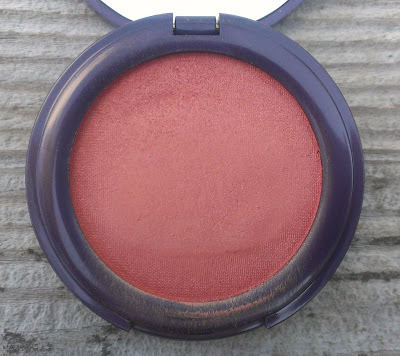 Now, I've mentioned recently that I really like the Airblush Maracuja Blush formula because while it's a cream blush, it has drier consistency than others that I've tried so it lasts on the skin longer than most cream products. It also has pretty packaging. 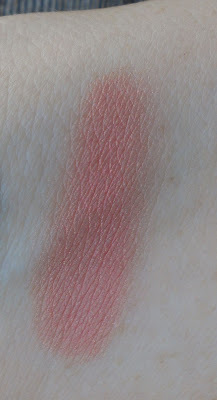 While I really liked the Shimmering Poppy shade from the first kit, this one totally trumps it. The shade name explains it all, I think. Despite its rather dark look in the pan, Shimmering Peach lives up to its name - it's a gorgeous peachy shade with subtle gold shimmer that gives the cheeks a lovely glow. 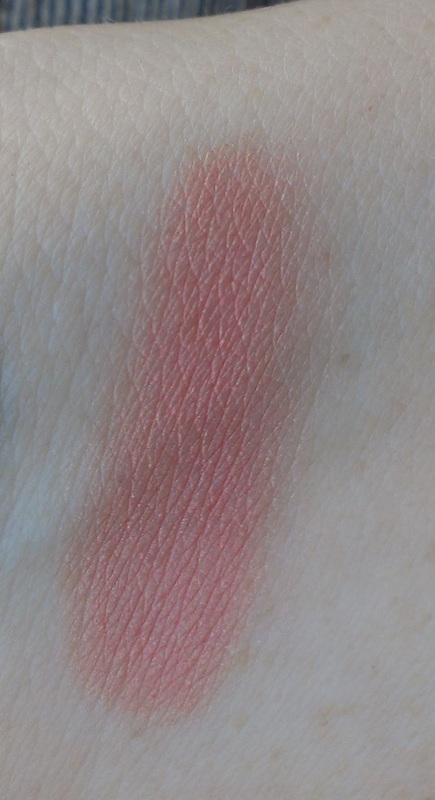 I find it easier to wear than the Shimmering Poppy from the first kit because Shimmering Poppy is a darker and has red undertones that can make me look sunburned if I apply too much. 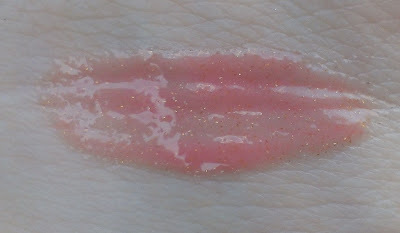 Shimmery Peach just adds healthy color to the cheeks. 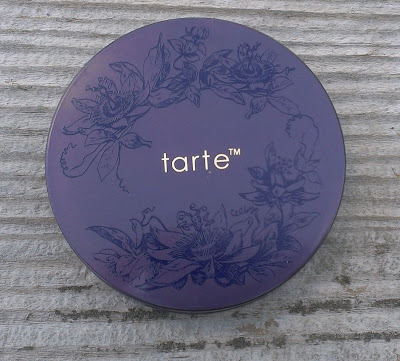 You can buy the Airblush in Shimmering Peach (and Poppy) at Tarte's website for $25. So, in the end, this kit is a total home run for me. I love every item in it. If you've delayed your A/D and like warm, peachy shades, I'd definitely go ahead and release your kit. You'll love it. I'm seriously thinking about wearing all of the shades again tomorrow. Are you as big a fan of peachy makeup as I am? If not, what's your shade weakness when it comes to makeup? I love that blush colour!! I am also addicted to anything peachy pink, especially blushes! How do you find the lasting power of the Airblushes on the cheeks? It really is such a lovely color - perfect for everyday wear, I think. I think that the Airblushes are some of the best cream blushes I've tried in terms of staying power. Their drier consistency allows them to stay on the skin a little better, IMO. I can typically get 4 to 5 hours of wear out of them without needing to reapply. 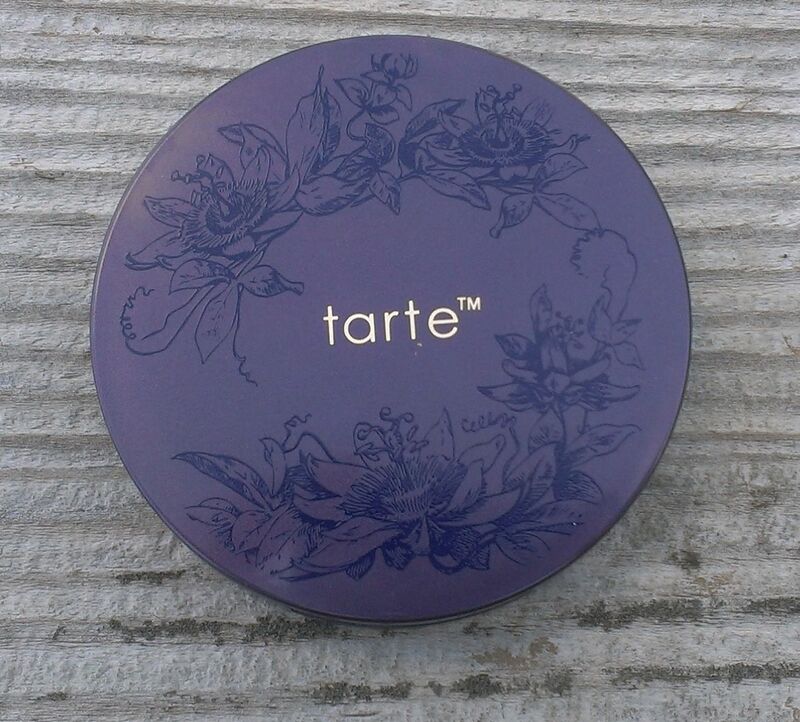 Though I do usually set them with either a powder blush in a similar color or a translucent powder.